If your dried beans habitually come out too mushy, too hard or too chewy, your humble crock-pot can step into the breach, reliably turning out a "just right" side dish or main course. The method for cooking dried beans is a straightforward one, but within that basic framework, you'll find the freedom to vary the beans, flavorings and cooking liquid in many ways. With other cooking methods, pre-soaking dried beans overnight is a must to avoid an underdone side dish. Yet the lengthy nature of crock-pot cooking naturally tenderizes the beans, making pre-soaking optional. Keep in mind, however, that beans are notorious culprits of gasiness in some people, and an overnight soak helps break down some of the enzymes responsible for that characteristic. In addition, if you're making kidney beans, leave time to boil them for 10 minutes before setting them in the crock-pot to remove the compounds that cause stomach distress. 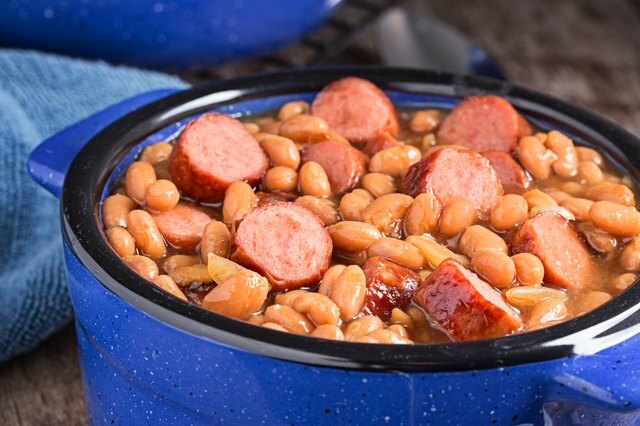 A small crock-pot can handle up to 1 pound of beans, but if you're cooking for a crowd or for extras for freezing, you'll need a crock-pot that's can cook at least 5 pounds. Remove any debris and split or discolored beans that you find in the dried beans before putting them in the crock-pot, if you haven't done an optional pre-soak. After rinsing the beans, set them in the crock-pot before you add any other ingredients. After putting the beans into the crock-pot, add your seasonings, and enough cooking liquid to cover the beans by about 2 inches. Those basic requirements obviously leave plenty of room for variation, even if you aren't adding other ingredients. Curry powder and red pepper pair with vegetable broth to bring a taste of India to chickpeas, for example, while black beans paired with a vinegar-spiked chicken broth, as well as fennel, oregano and cumin, evoke Cuban cuisine. Alternatively, add a French touch to white beans with herbes de Provence or other Mediterranean herb blends, and a cooking liquid made up of about two-thirds water or chicken broth and one-third white wine. Smoked meat products give beans extra flavor and body, while also making them into a hearty main entree. Use cubed ham, sausage rounds or smoked turkey for one-dish meals. Alternatively, add a leftover bone from a roast turkey, beef or ham, or ask your butcher for a ham hock, making sure to discard these ingredients before serving. Set any of these over the beans and aromatics; then add the cooking liquid. If you don't use meat, you may want to add a few drops of olive oil for flavor. 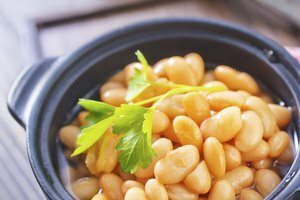 Other extras that can go into a bean dish include aromatics such as onions and garlic that you've caramelized in a pan prior to turning on the crock-pot, along with canned diced tomatoes and fresh corn or potatoes. Additional flavoring possibilities include mustard, brown sugar, barbecue sauce, ketchup or hot sauce. Items that require brief cooking, such as sliced hot dogs, sweet peppers or cooking greens, can be stirred into the bean pot in the last 30 minutes or so of the cooking process. After you plug your crock pot in, set the appliance to Low. Plan on the beans cooking for 6 to 8 hours, but begin checking them after 6 hours. 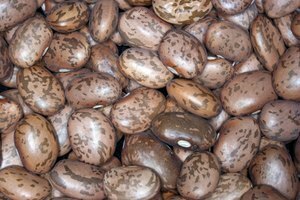 According to the Bean Institute, Great Northern beans are among the quickest-cooking, while kidney beans may not reach the tender stage as quickly. For safety and thorough cooking, make sure the crock-pot stays plugged in the entire cooking time and remove the lid infrequently, if at all.